I made it back from New York, and I think I’ve recovered from jet lag. I had a good time, but honestly, I was quite ready to leave. Something about the sheer number of people and rushing and dirt and smells made me a little bit insane (which is what happened when I realized it was time to move out last year). It was good to get away though- I had feared that visiting would make me miss it and re-open wonders of whether leaving was a good decision, but actually it made me feel much better about where I’m at. I’m so happy to live somewhere quieter and slower now, even if it’s not always ideal (ahem, it snowed this morning). Hopefully I’ll post a few photos of some of my NYC field trips this week, but right now I am excited to show off my new shirt/tunic thingy. I have had the sewing urge for a while now, and I wanted to make something before I dive into a big non-sewing project. I found this fabric in my stash (which I significantly reduced this weekend!) 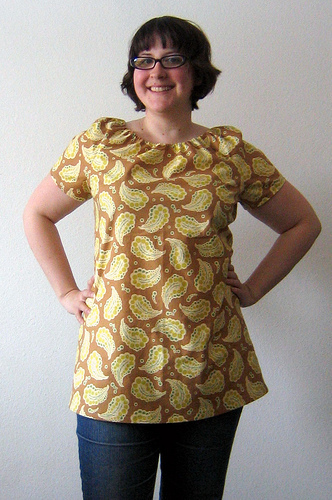 and made up a shirt with Built By Wendy 3835. Things I did differently were: made the sleeves longer with no elastic, lengthened the hem by about 4 inches with a slight flare and added the darts from the dress version of the pattern. The darts make it a tiny bit tricky to get on, but they’re worth adding because otherwise the shirt can be kind of shapeless (as I learned with the first one). This pattern really is SO simple and quick. I cut the pattern during the Spurs-Suns playoff game yesterday (did anyone see it? It was intense!) and sewed it up in two half-hour ish sessions last night and this morning. I would definitely make this version again… I’m getting to the point where I have enough sewn tops in my wardrobe that I could wear them all week if I wanted to. Which I do. Yay. For more Built By Wendy inspiration, check out the flickr pool. This pattern has been sitting in my fabric drawer for I don't know how long, and I've seen tons of cute shirts (like yours!). Thanks for sharing the flickr pool, maybe I just need a little more inspiration! I agree with the first poster that said it's very flattering. I have some floral material that I've been aching to use, I may make one of these as well :). That is so cute & looks great on you!